Today there are 500 museums in Moscow and the number is constantly growing. Must see. The State Tretyakov Gallery. The main Art Gallery in Moscow boasts a collection of more than 17 000 works of art and is divided between two buildings. Do you want to get the full picture of the development of Russian painting from the icon to avant-garde and to see the major masterpieces of Russian art? 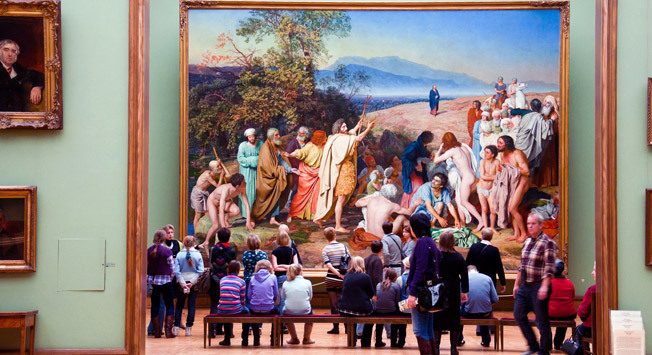 Then the Tretyakov is a “must see” for you. Guided tours for foreigners started here back in the in 50s. Since then, the foreign language excursion department has grown considerably. The museum tours are now offered not only in English but also in German and French. Despite the popularity of Russian art of the 20th century, foreign visitors prefer to get to know the origins of the development of the Russian art. That's why the building in Lavrushinsky Lane draws more attention than the one situated in Krymsky Val. The tour’s price is 4,500 rubles for a group in addition to the entrance ticket. Multimedia Art Museum. The most impressive. Under the direction of the charismatic Olga Sviblova the “Moscow House of Photography” was transformed in the center of contemporary art, which seems especially to the taste of the audience. “Moscow House of Photography” Media Museum and School of Photography and Multimedia Rodchenko coexist here thus turning it into one of the most powerful exhibition areas of the capital. Usually at the same time it hosts several exhibitions: photography, works of modern Russian and Western art assembled together. No wonder this place is very popular among the students of the British School of Design and Strelka Institute. Where else can you see works of Hirst, Banksy and Schelkovsky in one exhibition space? Museum workers conduct tours in English and Russian language for everyone, trying to help the visitors to understand contemporary art. The tour’s price is 500 rubles per person plus entrance ticket. Jewish Museum and Tolerance Center. The most innovative. The museum and center opened in 2012 in a constructivist building, which once was an impressively large bus depot. In an area of 8,500 square meters there is a permanent exposition dedicated to the history and culture of the Jewish, cinema, the Center of Tolerance and space for the temporary exhibitions. This place is considered to be one of the best museums in Moscow. Its undoubted advantage is an interactive vehicle of delivering information. At many of the exhibits, not only are you allowed, but you are strongly recommended to touch, which increases the audience’s interest. Often tourists who are visiting this place have Jewish roots. That’s why the excursions are offered not only in English but also in Hebrew. The tour’s price is 2000 rubles for a group plus entrance tickets. Shchusev State Museum of Architecture. The least obvious. This is the only museum in Moscow with the focus on architecture, which actively developes. Today there is no permanent exposition, but the museum hosts a large number of excellent exhibitions devoted, of course, to both Russian and Western architecture. Inside the outbuilding “Ruin” located in the courtyard you can hear perhaps the best series of lectures on the history of World Art and architecture that the city has to offer but for the present moment only in the Russian language. Guide tours in foreign languages have appeared recently. They were established and now are conducted in English exclusively with the help of museum workers. Their number is small – only 4 people, but here you can have one of the best excursions in Moscow, for they are always told by the professional art-historians. For a large group of listeners the museum can find specialists who are ready to conduct tours in other European Languages (German, French, Italian). The tour’s price is 3000 rubles for a group. Garage Center for Contemporary Culture. The most fashionable. One of the most popular art spaces in Moscow. Moved in 2012 to a new building in Gorky Park, Garage became very attractive for creative people: museum workers, students of art schools, hipsters, everyone who somehow is taking interest in contemporary culture visits this place. Public excitement around this center caused not only by the high level of presented art but also by many education programs: lectures about art from world known famous curators, presentations and courses. Even the youngest visitors can find activities for themselves: Garage provides special programs for children (native Russian isn’t a requirement). In 2012 Center launched its own publishing program. Books and magazines, contemporary art catalogues and souvenirs can be found in the bookstore.